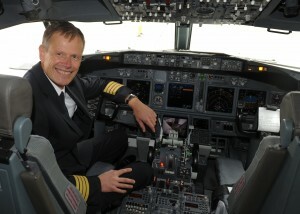 Klaus Wehrmann is a captain in airberlin’s Boeing 737 fleet and has been flying with airberlin for ten years. Since 2012, he has been passing on his knowledge in the subject of fuel-efficient flying as a volunteer Fuel Coach. “The reduction of fuel consumption and the associated decrease in CO2 emissions is in everyone’s interest. It decreases the impact on the environment, it reduces the consumption of fossil fuels and, of course, it leads to financial savings for the airline. There are many different ways that we pilots can save fuel and I would like to make a contribution in this area. Since the program is voluntary, all the participants are highly motivated and in the meantime I have also noticed that pilots who have not yet taken part in the program are becoming very interested. How can you save fuel when flying? Pilots have various options for saving fuel before and during the flight and also after they have landed. For example, we can connect to ground power at the airport before departure, instead of using the auxiliary power unit in the rear of the aircraft, which can otherwise supply the aircraft with electricity once the engines have been switched off. Additionally, at the end of a flight, the continous descent approach, if feasible, is the best way of reducing fuel consumption. Another potential way of saving fuel is the Single Engine Taxi, which is when the aircraft moves from the landing runway to the gate using only one engine. Even if the measures taken on a single flight sometimes only constitute a low reduction, the overall savings resulting from a vast number of flights adopting these measures can make a huge difference. As a pilot you have to keep an eye on many things at the same time. Does fuel-efficient flying mean an additional burden? No, not at all. It’s much more a question of adapting your daily routine in the cockpit in line with fuel-efficient flying techniques. As a pilot, you continuously undergo training because of further developments in technology for example, so you are accustomed to mastering new procedures. Consequently the elements of flying that are aimed at saving fuel quickly become routine. In 2012, airberlin trained 60 pilots as Fuel Coaches who passed on their knowledge to around 280 pilots by means of Fuel Efficiency Flights. airberlin is currently offering all its pilots further opportunities of taking part in voluntary Fuel Efficiency Training. Following an online course providing the theoretical foundations, the techniques can be put into practice on a Fuel Efficiency Flight under the supervision of a Fuel Coach. It is by no means a matter of filling the tank with less fuel, but rather a question of consuming less of the fuel which has been loaded. Fuel Coaches are an important part of airberlin’s Eco-Efficient Flying program. In 2012, Germany’s second largest airline already set a new record with its average fuel consumption of 3.4 litres per 100 passenger kilometers flown.